In Caballero's case, it wasn’t until she was at the curb at the John F. Kennedy Airport that she learned she would actually have to leave. Immigration and Customs Enforcement officers took her away, as her children watched. Caballero is from San Pedro Sula, one of the most violent cities in Honduras - a country with one of the highest murder rates in the world. In 2005, when she was 24, she crossed the U.S. border illegally and met and married Miguel Torres, a U.S. citizen from Puerto Rico. They moved to Waterbury with their two children. Caballero was able to get a work permit. Things changed in early 2016 when the family was told she’d have to start reporting to ICE. Torres said they complied with these orders until summer of this year. “The last week of July they came back to us and told us, ‘You have to buy a ticket for August the 8th. She have to leave the country,’" said Torres. After working with several attorneys, the family connected with New Haven immigration lawyer Glenn Formica. Early in the morning of August 8, with no word yet from the Board of Immigration Appeals, Formica advised the family to comply with the ICE order and go to the airport. Torres drove into New York City with Caballero in the front seat of the car, and their children, 10 and 7 years old, in the back. Torres said they expected to come back with her that day. When they got to the airport, he said they were met at the curb by ICE officers. Torres phoned Formica who immediately put in a call to the Board of Immigration Appeals. Then Formica spoke with the ICE officers. He told them there was still no decision, so she couldn’t get on this flight. Minutes later, Formica got a call on the other phone line, saying the stay had been denied. “She ended up having to get on a plane without more than a few minutes notice on the stay denial,” he said. In an email, ICE spokesman John Mohan confirmed that Glenda was deported in August. He said there’s no typical timeline for removals which are done on a case-by-case basis. Torres became emotional as he described how the separation has affected his children. Torres said he’s explained that the family can’t move to Central America to be with their mom. Then, he suggested to me that we speak directly with Glenda. So we called her in Honduras and talked via FaceTime. Lawyer Glenn Formica said he’s troubled by what appears to be a growing number of stay of deportation denials coming in at the last minute. Formica is currently pursuing humanitarian parole for Caballero, which would allow her to enter the U.S. for a period of time while her case is being processed. But he admitted, it's a long shot. In the vast majority of cases, deportees are barred from returning to the U.S. for 10 years. 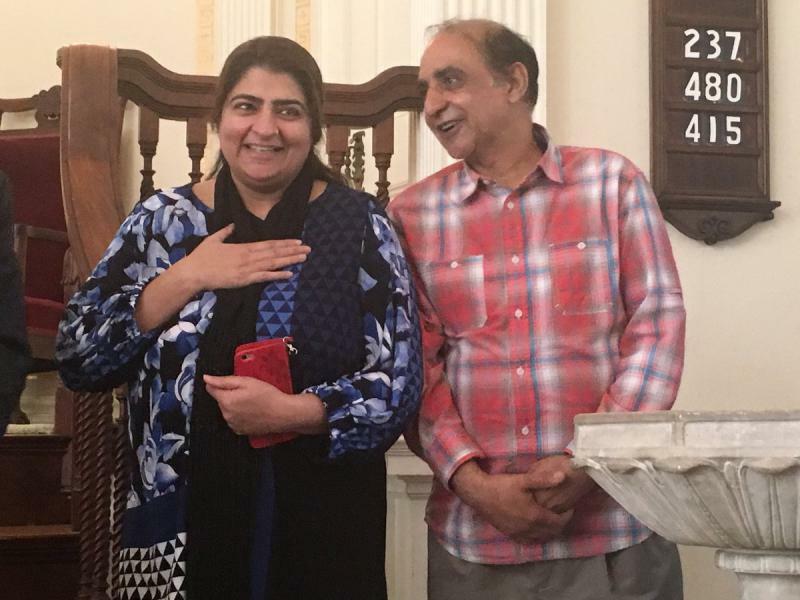 A Pakistani couple is returning to New Britain, Connecticut, after living in a church for seven months. Immigration officials have decided not to deport them while their case is pending in federal appeals court. Sanctuary cities have become a focus in the national debate on immigration reform. But what are they? Where are they? And how do they affect communities around the country? A coalition of New Haven high school and college students staged a walkout Thursday in support of Nelson Pinos. He’s the Ecuadorian husband and father of three who took sanctuary in a city church nearly a year ago to avoid deportation.